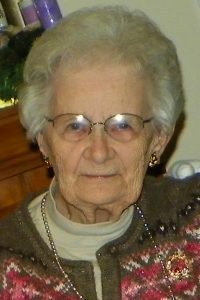 Kathleen Speicher, 93, formerly of Bellwood and Columbus, died Sunday, June 19, 2016, at the Independent House in Lincoln. THURSDAY, JUNE 23, 2016 10:00 A.M.
VISITATION WEDNESDAY 5-7 ROSARY 7 P.M.
Kathleen Lepley was born on a farm near Gifford, Iowa on November 7, 1922 to Ed and Jessie (MacDonald) Lepley. She attended Gifford (IA) Elementary School and graduated from New Providence (IA) High School in 1939. One of four children, she grew up on the family farm.After high school, Kathleen attended Iowa State Teachers College in Cedar Falls. In 1942, Kathleen attended the Electronic Radio-Television Institute in Omaha. Here she met Anna Speicher who was to become her lifelong friend and future sister-in-law. Upon graduation the two women, along with other classmates, traveled to Washington D.C. to work for the main office of Postal Telegraph.In between trips to Anna’s parents’ home near David City, NE, they also worked and traveled in Florida, Mississippi, Arizona and Illinois. In March, 1947 they returned to Nebraska, purchasing and operating the Rising City Tavern before selling it in April, 1948. On May 10, 1948 Kathleen married Anna’s brother Leo, and she and Leo resided on a farm west of David City for the next 36 years. There she was a homemaker, hosting numerous family dinners, and with her husband raising three children. In 1984 they retired to Columbus.Leo died in 1997. To be closer to her family, Kathleen moved to Lincoln in 2012.She most enjoyed spending time with family, friends and neighbors. Survivors include three children, daughters Carol (Steven Petersen) Speicher and Joan Speicher-Simpson of Lincoln, and son Mark Speicher of Torrance, CA, and one granddaughter, Karrie (Dan) Simpson of Lincoln, sister-in-law Rosalie (Ted) Reeder of Plano, TX, brother-in-law Robert Schindler of Salt Lake City, Utah, and many nieces and nephews and their families. She was preceded in death by her husband Leo, brother Edward Lepley, and sisters Iona Marsh Perisho and Virginia Mitchell.